Growing up I remember having this delightful dessert every year when we went caroling to the houses of various members of our church. My mom never made this at home so this was my only chance to have it. Inevitably, at least one household had this dessert laid out for the carolers and I very clearly remember anxiously devouring it by the spoonfuls with no shame. This dessert can be made a couple of days in advance and allowed to sit in the refrigerator. Making it in advance will enhance the flavor. In addition to my listed ingredients many people add dried fruit such as raisins or diced dried apricots to the mix. I like the dessert better with less ingredients, but for those who like it a bit sweeter and chunkier you can always add a cup or so of any dried fruit to this recipe. 1. 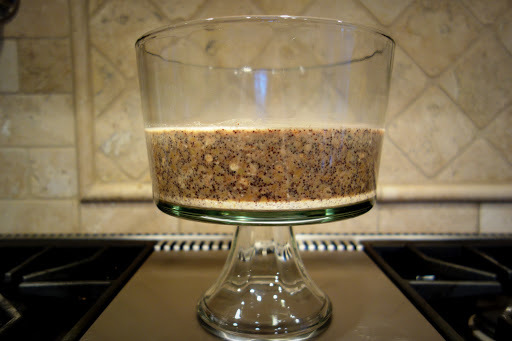 Place your 2 cups of wheat berries and 3 quarts of water in a large pot and let the berries soak overnight. The following day, bring the wheat berries to a boil. Allow to lightly boil for about 20 minutes. Then turn your heat down to a simmer and allow the wheat berries to simmer for about 4-5 hours. Stir occasionally to prevent any sticking. You will know the wheat is ready when the kernels are burst open and the liquid is pretty thick and creamy. 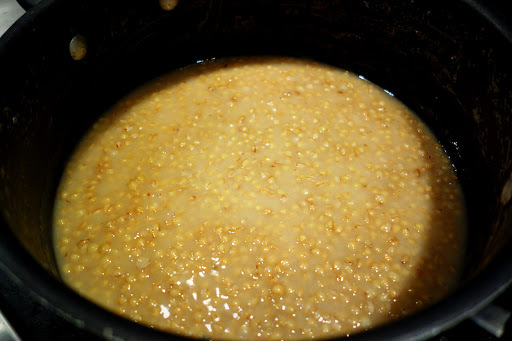 The longer you simmer the wheat berries the creamier and thicker the mixture will be. 2. Meanwhile, combine your poppy seeds and honey. Most people will grind the poppy seeds in a food processor or coffee grinder but I like to keep the seeds the way they are without grinding them. 3. Combine the sugar and hot water. Mix until all the sugar has dissolved and set aside. 4. Crush your walnuts (do 1-1 1/2 cups walnuts depending on how much crunch you want) by putting them in a baggie and beating them with a kitchen hammer (the back of a large spoon will work just as well). Set aside. 5. 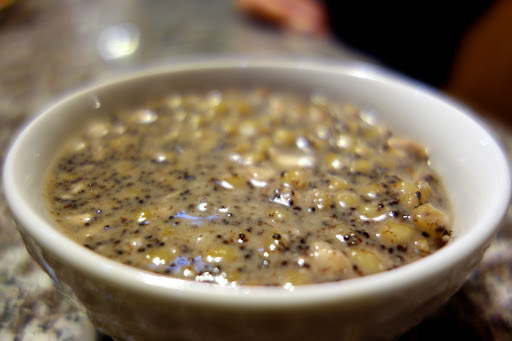 Once your wheat berries are ready, that is they’ve absorbed almost all the water and the remaining fluid is thick and creamy, add the poppy seed mixture to the wheat berries. 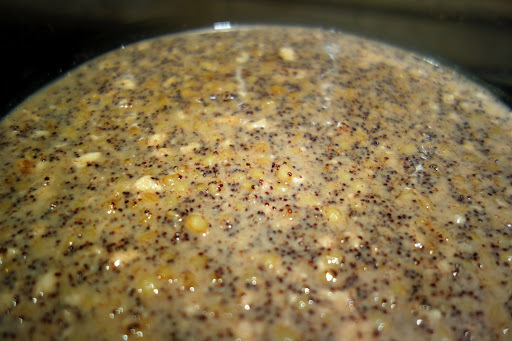 Stir until the poppy seeds are distributed evenly. Then add the sugar water and the chopped nuts to the pot. I kept the range on simmer while adding all these ingredients, I feel like it helped me mix everything better with that heat. Once everything is thoroughly mixed remove the pot from the range and set it aside to cool. Once cooled off, refrigerate and serve cold or at room temperature. I will be trying this. As breakfast not dessert. It was so good! This entry was posted on January 31, 2013 by natalyaperullo in Food.